Workers at the Life Enrichment Center are about halfway through a project that will brighten and tackle humidity in the 200 overnight rooms at the retreat. 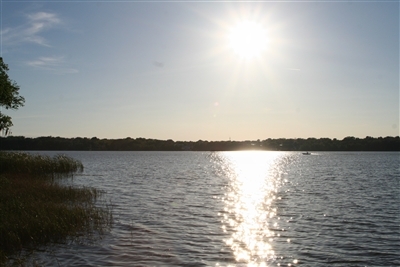 FRUITLAND PARK – Lake Griffin provides an inspiring backdrop for spiritual reflection, making the Florida Conference's Life Enrichment Center (LEC) a popular meeting spot for Christians seeking God's guidance. About 10,500 visitors spend time at the tree-shaded retreat each year, mostly in the cooler autumn and winter months. But summers by the lake can pose a maintenance challenge in the buildings intended to offer comfortable overnight lodging. Last year, the LEC received a $48,500 grant from the Board of Camps & Retreat Ministries to combat Central Florida's renowned humidity. Workers are about halfway through a renovation project that will put fresh paint, a dehumidifier and ceiling fans in each of the 200 rooms at the retreat, said Rev. Jess Schload, LEC director. The project, which also included industrial-sized fans in attic spaces and some replacement of mirrors and light fixtures, is expected to be completed by year's end. "We're trying to brighten things up and take care of any mildew and mold issues permanently," Schload said. 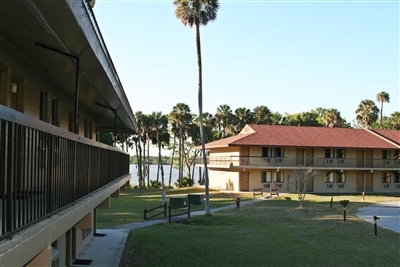 All four lodges at the retreat were built in 1978. 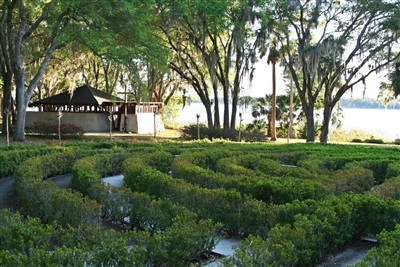 Lake Griffin, above, and the Prayer Labyrinth, below, make the Life Enrichment Center ideal for reflection and renewal. Though solidly built, they are not conducive to central climate control, so the individual room dehumidifiers were the best option for times when air conditioners are not running. The next step will be to replace and reconfigure the bathroom counters and sinks and install the dehumidifiers so that they drain into the plumbing, Schload said, but he has not identified a funding source for that project yet. In the meantime, retreat staff will remove the appliances when the rooms are occupied and put them back when visitors leave. Schload said feedback has been positive. "Folks are constantly stopping me and saying [good] things," he said, recalling in particular a repeat visitor who always stays in the same room. "She was just amazed at the difference it made." The LEC also asked for donations from regular visitors, letting them know that the renovations cost about $200 per room. Schload said he was surprised at the number of checks he received for the full amount of $200. The effort raised another $12,000 to augment the conference grant. People can still contribute by visiting the LEC website, www.lecretreats.org, and clicking on the link under "Donate Now." 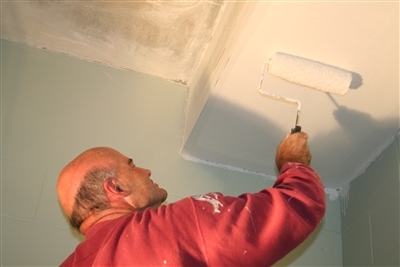 Above, worker Bryan Schien paints the ceiling in an LEC guest room, part of sprucing up the lodging at the popular retreat. 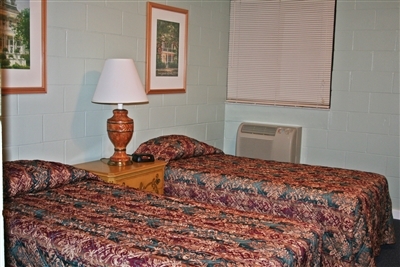 Below, recent upgrades offer guests brighter rooms at the LEC. Other updates at the center include getting the Cokesbury building ready to host meetings after the bookstore closes April 20. Schload said the building already has wireless Internet and can become meeting space fairly quickly once the bookstore moves out. The new meeting space will join the large auditorium and the Pearson Meeting Room that opened last year as options available to groups of different sizes. The improvements build on 2007 upgrades to carpet and mattresses in the rooms, as well as a facelift in the LEC dining hall. Schload said bookings at the LEC have increased in recent years, in part because Camps and Retreat Ministries staff has been marketing the retreat as a prime meeting spot not only for United Methodists but for Christians of other denominations. United Methodists, including United Methodist Women and United Methodist Men's gatherings, account for about 50 percent of events at the LEC, Schload said. "Our fastest-growing segment is our Hispanic-speaking churches," he added. Among other frequent users are members of the Evangelical Lutheran Church in America, a full communion partner of The United Methodist Church since 2009. The LEC relies on Florida-based groups for its bread and butter, but has been a winter destination for national meetings in recent years.